which the settlement developed, based on our interpretation of the evidence currently to hand. It is not an immutable boundary line, and may need to be modified as new discoveries are made. The map does not show those areas or buildings that are statutorily designated, nor does it pick out those sites or features that are specifically mentioned in the text. We have not referenced the sources that have been examined to produce this report, but that information will be available in the Historic Environment Record (HER) maintained by the Clwyd-Powys Archaeological Trust. Numbers in brackets are primary record numbers used in the HER to provide information that is specific to individual sites and features. These can be accessed on-line through the Archwilio website (www.archwilio.org.uk). The earliest form of the name is Clastbyrig, recorded in 1056 incorporating the Old Welsh clas meaning a monastic community and Old English burh, signifying a defended enclosure. In the 16th century, its Welsh name was y Klas ar Wy, or the clas on the Wye. In the absence of any evidence to the contrary, it has to be assumed that the clas community occupied a site that gave them some protection, perhaps from human aggressors though possibly from the river. The 'clas' foundation (516) is reputed to have been established in the 7th century AD by St Cynidr, and a tradition evolved that this was on Ffynnon Gynydd common some 2.5km northnorth- west of the village, largely because this is the location for St Cynidr’s well, and this tradition then became fact. In fact the clas was almost certainly on the valley floor where the earthworks of it or its successor can still be observed, though the shifting course of the river means the site is now on the south of the river and divorced from Glasbury itself. The manor of Glasbury was granted to St Peter's, Gloucester in 1056, providing the explanation for the church's dedication. Soon after the Norman Conquest in 1090 a new church was built on the site of the clas beside the River Wye. During the Middle Ages a nucleated settlement emerged at Glasbury, more perhaps because there was a crossing point of the river here than because of the long ecclesiastical history. An estate map of 1753 depicts a village with well-spaced dwellings, nearly a dozen in all, and a green, encroached on by three cottages in the centre. Some elements of this pattern are certainly medieval. By this date a stone bridge had replaced the wooden one which was destroyed in 1738. The church was abandoned during the 17th century when the river’s course changed and more than a century later the configuration was disrupted by the construction of Glasbury House. At least two houses were removed to make way for the house, others may have disappeared in the landscaping, and a road leading to the river was abandoned. The Green is an appellation still attached to an area within the village, rather smaller than its medieval predecessor. A century later, the Tithe survey reveals the infilling of open spaces within the village and some expansion north-west towards Cwmbach. 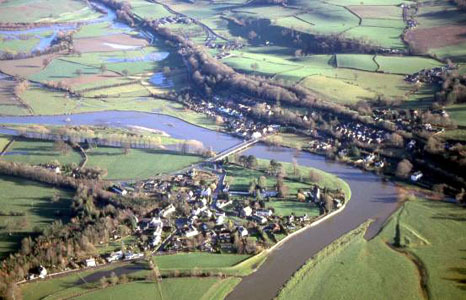 In summary, Glasbury could have developed as a common or green-side settlement in the Middle Ages. Although only two pre-18th-century dwellings remain, others are likely to have existed around the open common and on the lanes approaching it. perhaps prior to 1088, or around 144 when the land was acquired by the Cliffords. Its remains - a low mound and traces of a ditch - were apparently levelled and destroyed during housing construction between 1975 and 1979, though it is conceivable that sub-surface features survive in the plots not yet developed. Glasbury Old Vicarage (524; Grade II* listing) originated as a medieval stone dwelling, sometime after 1400, and has been identified as a pre-Reformation priest's house. Though modernised, some Tudor work is preserved on the north-west and there is an inscription of 1611 on the chimney. Next to the Old Vicarage is a barn of cruck construction (16017; Grade II* listing), perhaps for vicarial tithes and considered to be of 15th-century origin. The Forge is a stone-built cross-passage house of c.1600. No other listed buildings in the village are known to pre-date the late 18th century, though Grangeton (36567) is thought to have had earlier origins because of its gable-end position to the lane.